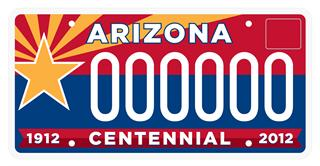 The Arizona Centennial Foundation’s specialty license plate is finally available. According to the Arizona Republic, $17 of each $25 for the plate will go to the Foundation for its events and projects. The Republics October 30th story was half correct about the funds. Up thru June 2012, the funds do support centennial events and projects as stated. However, after that (per 2011 Senate Bill 1262) they go to the Arizona Historical Society for their already failed Arizona Centennial Museum project. Donors should know what is actually happening to their money. Like the Foundations' logo, the plate is simply a scrambled Arizona flag. Ironically, it prominently features the copper star representing Arizona’s copper industry. Since funds from the plate will ultimately go to the AHS, they will help finance the destruction of the mineral museum and Arizona’s copper legacy. Arizonans should boycott this specialty plate. Is history in the way of Centennial Way? Construction for our Signature Project, Centennial Way, began in May and is still underway! 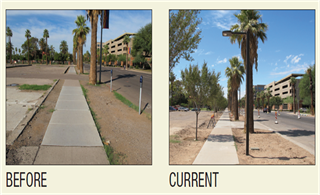 A combined effort between the Arizona Department of Transportation, the city of Phoenix and the Arizona Centennial Commission, this project will re-work this entire street into a beautiful gateway to our State Capitol. Work has progressed from 7th Avenue to the former mineral museum building. Progress is illustrated with the following before and after photos. Do Centennial Way planners now intend to remove the “ugly” historic mining equipment still at the former mineral museum to make room for their “beautiful gateway”? Is this a good use of $7 million in public funds?